Personalized Embellished Oval 3 Line Address Sign - - beautifully decorated oval wall sign displays your house number in tall 3" characters. Made in USA. The top and bottom lines of personalization emphasize the sign's gentle oval shape. Line 1 holds up to fifteen 1.25" characters. Line 2 hold up to six 3" characters. Line 3 holds up to fifteen 1.25" characters. Colors: AB antique brass, AC antique copper, BG black with gold characters, WG white with gold characters, OB oil rubbed bronze, OG bronze with gold characters, PS pewter with silver characters, GG green with gold characters, RG red with gold characters, BS black with silver characters, and BW black with white characters. Shown above in PS pewter silver. 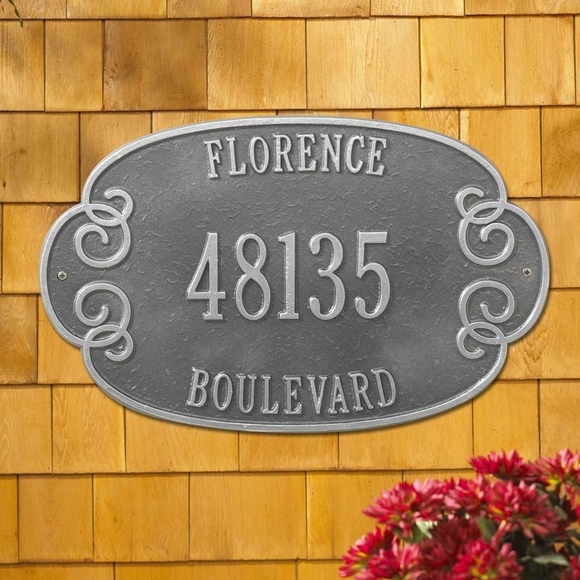 Tasteful and beautifully decorated modified oval address plaque. The house sign was delivered today. Absolutely beautiful. Thanks. If you want to use me for a reference, feel free. better than expected. It came out really well and may people have asked me where I got it from.